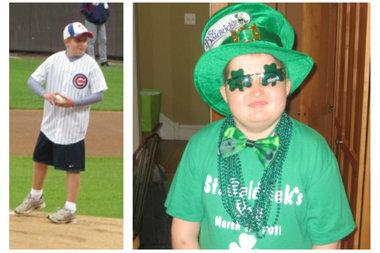 Patrick Thomas McNamara, 13, was able to throw out the first pitch at Wrigley Field before he died Oct. 14, 2011. The Beverly boy who fought an 11-year battle with a brain tumor also donned a party hat and shamrock sunglasses ahead of a St. Baldrick's Day event in early March 2011. BEVERLY — The weekend of the South Side Irish St. Patrick's Day Parade begins Friday night with a fundraiser for Pat Mac's Pack. The charity named for the late Patrick Thomas McNamara will hold its sixth annual fundraiser from 7 p.m.-midnight at the parish at 10121 S. Longwood Drive in Beverly. It costs $20 to attend the 21-and-older event. The party drew some 500 people last year and raised nearly $68,000 for pediatric brain tumor research and other related causes, Tom McNamara said Wednesday. McNamara and his wife, Dee, are behind the charity named for their son who died Oct. 14, 2011. The gregarious 13-year-old boy battled a brain tumor for 11 years before it took his life. His spirit lives on through the charity that uses a logo of a green top hat placed above a pair of shamrock sunglasses and a matching green bow tie. Patrick wore this same outfit upon his return to St. Barnabas School in early March 2011. He had just finished after another stint in the hospital and was embraced by fellow students. Patrick later told his teachers that it was the best day of his life, Dee McNamara said. Patrick would have been a freshman in college this year, and his grade-school pal Will Thompson will return from the University of Dayton to play the bagpipes at the party honoring his late friend, Tom McNamara said. The Irish rock band Sean and Charlie will also perform at the fundraiser that will further include raffles, a cash bar and food for sale. There will also be barbers on hand to shave heads for the St. Baldrick's Foundation. The money collected from the haircuts will be directed to the California-based charity that raised $38.6 million to fight childhood cancer last year. All shavees are asked to pre-register on the St. Baldrick's website. The other proceeds from the party are split between supporting pediatric brain tumor research at the Ann and Robert H. Lurie Children's Hospital and the Streeterville hospital's Brain Tumor Patient Emergency Fund. The fund provides financial support to parents struggling to pay for everything from parking at the hospital to meals and utility bills as they navigate the treacherous road of having a child with a brain tumor. Pat Mac's Pack also raises money for these same charities via its annual summer bike ride. And local brew pub Horse Thief Hollow has even created a beer for the charity and donates a large batch of the beer to be sold at the fundraiser. Meanwhile, the South Side Irish St. Patrick's Day Parade begins at noon Sunday. The annual march down Western Avenue starts at 103rd Street and ends at 115th Street.